The 2017 Hyundai Ioniq is three cars in one: the Hybrid (better fuel economy than the Prius), the Electric (best electric fuel economy in America), and the Plug-in hybrid. The Ioniq line follows Hyundai's trademark value statement, offering smart, clever features for a reasonable price. The Bolt and the Prius are intimidating rivals, but the Hyundai is an appealing alternative. It's very easy to keep your gas mileage high, as long as you don't ask too much of the engine. Meaning, don't push it to 80mph on a hill. I love my car! The gas mileage is fantastic, between 575 and 600 mpg depending on how I drive (street vs freeway). I own a base model and I feel like she has all the luxury I need. The blindspot mirror is fantastic along with the ability to run Android Auto through the screen. I highly recommend this car! Quiet car. Great for couples with no kids. Good mileage. Gets about 50 miles/gallons. It is not a family car, it is very spacious in the front and in the trunk, but hardly fits anyone in the back sit. It comes with very good liquid proof sits, so it is easy to keep clean. It is very reliable in long trips and it is the quietest car I have been in. The gas mileage is comparable to a Prius, but you will want to get one of the higher tier models or you won't get many features. I like my vehicle, but it has a very low ground clearance which makes me worry it will get stuck in snow easily. I also miss turning a key to start, because the car is so quiet that it is hard to tell when the engine has started. It also has a narrow range of view out the back window. 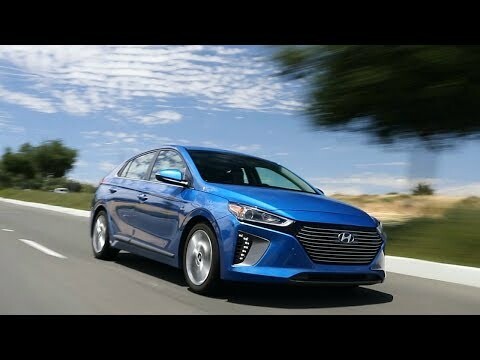 2017 Hyundai Ioniq Hybrid Review and Road Test In 4K UHD! Hyundai will notify owners, and dealers will inspect the Power Relay Assembly (PRA) for damage. If no damage is found, the main relay will be replaced. If damage is found, the PRA will be replaced. These repairs will be performed free of charge. Initial owner notification letters were mailed on December 3, 2018. A second letter will be mailed once the remedy is available. Owners may contact Hyundai customer service at 1-855-371-9460. Hyundai's number for this recall is 178. Hyundai Motor America (Hyundai) is recalling certain 2017 Hyundai Ioniq Hybrid vehicles. The Hydraulic Clutch Actuator (HCA) inner oil seal may leak, allowing oil to accumulate in the cap area, possibly resulting in an electrical short. Hyundai will notify owners, and dealers will inspect the HCA caps for leaked oil and replace the HCA assembly if needed, free of charge. The recall is expected to begin June 20, 2018. Owners may contact Hyundai customer service at 1-855-371-9460. Hyundai's number for this recall is 176.